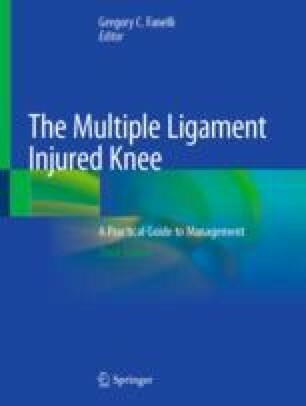 The principles of reconstruction in the multiple ligament-injured knee are to identify and treat all pathology, accurate tunnel placement, anatomic graft insertion sites, utilize strong graft material, mechanical graft tensioning, secure graft fixation, and a deliberate postoperative rehabilitation program. This chapter will concentrate on my experience using a mechanical graft tensioning boot during posterior cruciate ligament reconstruction, and anterior cruciate ligament reconstruction, in the case of the multiple ligament-injured knee. The use of the graft tensioning boot, the PCL and ACL reconstruction surgical techniques, the cyclic dynamic method of graft tensioning, and the comparative results using the graft tensioning boot will be presented in this chapter.